An Amtrak spokeswoman said the train’s engineer was removed from his post after the accident. Sunday’s derailment of an Amtrak passenger train near Steilacoom happened because the engineer approached a drawbridge going faster than the 40-mph speed limit, railroad officials say. Amtrak blames human error for the accident, which caused minor injuries to some of the 267 passengers aboard, spokeswoman Vernae Graham said in a statement Thursday. The train’s engineer has been suspended, Graham said. About 100 yards before the Chambers Bay bridge, the northbound passenger train passed a final signal that, when red, tells the engineer to stop because the drawbridge is being raised or lowered. The train then moved through a derail device that knocked it off the rails before reaching the bridge, Amtrak said. 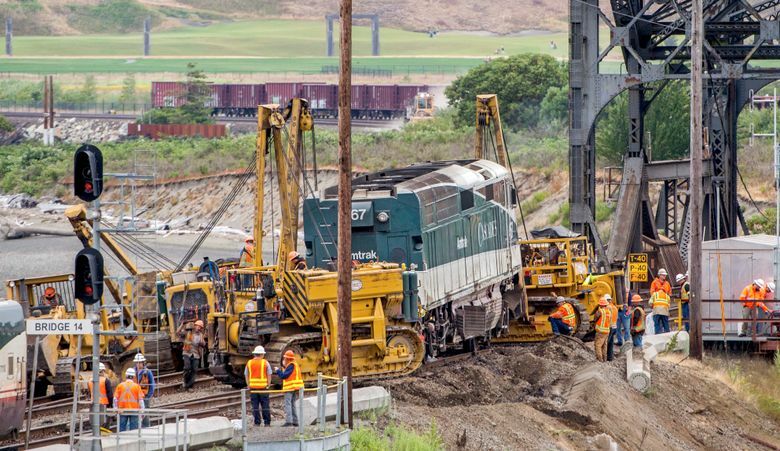 “The derail is there to keep trains from proceeding when the bridge is in the ‘up’ position,” said Mike Elliott, Washington state government affairs director and spokesman for the Brotherhood of Locomotive Engineers and Trainmen. Based on pictures, Elliott figures the train probably slowed to 10 or 20 mph by the time the switch-like device opened the trackway, so the locomotive rolled into the gravel alongside. Six railroad vehicles — the locomotive, baggage car and four passenger cars — went fully or slightly off the rails. Another eight passenger cars and a rear locomotive stayed upright, Graham’s statement said. Initial witness accounts said only four rail vehicles derailed. Signals are 1½ to 2 miles apart. On most modern tracks, if a drawbridge is not locked in place an engineer would likely see a flashing yellow light, followed by a solid yellow light, and be decelerating before approaching the red stop signal a couple minutes later, Elliott said. Elliott, a former engineer who has worked on the corridor, said he wants more information about the signal sequence. “What signal did the engineer see and remember, in terms of the signal sequencing and the forewarning of the impending stop?” he said. Amtrak declined to answer detailed questions Thursday about bridge position and signals. BNSF Railway, which owns the tracks, said it has no further comment because its investigation is still underway. Meanwhile, the Washington State Department of Transportation’s rail division, a co-owner of the regional Cascades trains, asked Amtrak to produce a “corrective action plan” to prevent future incidents. WSDOT is spending $800 million in stimulus funds from the Obama administration to improve passenger train speed and reliability. The drawbridge, built in 1914, allows boats from a nearby marina to reach Puget Sound, next to the Chambers Bay links golf course. Passengers reported seeing someone wearing an orange vest in the water during the incident. A full-time bridge tender is stationed there. BNSF spokesman Gus Melonas did confirm a worker jumped off the bridge, falling down the bank and into the water. The worker sustained minor injuries. BNSF has installed new-generation positive train-control systems, which use satellite technology to prevent collisions and missed signals. Amtrak is scheduled to install this technology in its locomotives by the end of 2018. Freight and passenger trains resumed operating a few hours after the derailment, and crews repaired the damaged rail the next day. The Amtrak Cascades 506 runs between Eugene and Vancouver, B.C. 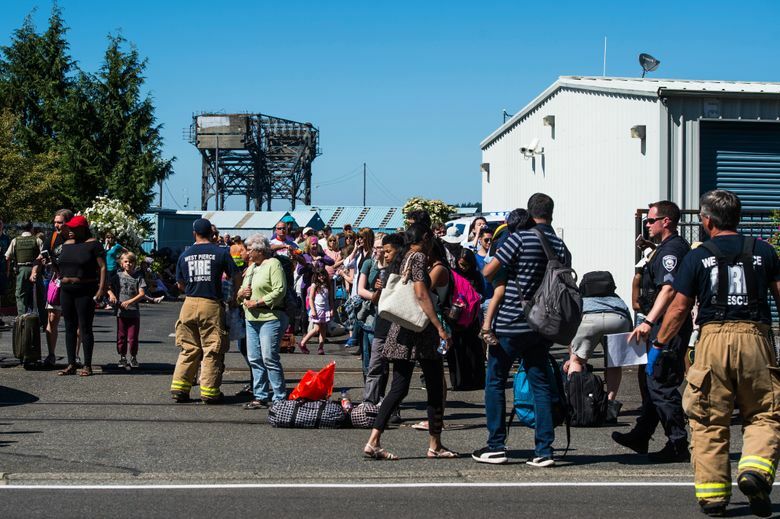 Amtrak dispatched buses to pick up the evacuated passengers Sunday night, but baggage didn’t arrive at Seattle until Monday night, after the baggage car was righted and stabilized. Washington state rail officials say this was the first time Amtrak Cascades passenger cars derailed since the service began in 1999. Last year, a locomotive went off the tracks at less than 5 mph near Tukwila Station, causing no injuries.